The ice fishing season only lasts for a couple of months so most anglers try to get out as many times as possible. This can lead to trouble at home for anglers with a significant other and kids. If you are in this boat, why not make everybody happy and bring your child fishing while your wife goes shopping with the girls? Who could resist bringing this youngster fishing? Bringing a kid fishing is not a walk in the park. A child will remember his/her first fishing trip with dad as a good one or a bad one. Do not let this discourage you. It is easy to make your child's first trip a memorable one by doing a couple of simple things. The most important thing to remember is to make sure the child is warm at all times. An angler should have at least a shanty to break the wind and a heater if it is a really cold day. I prefer to bring my youngster out on milder days so I can leave the heater at home. The heater is an extra thing I have to make sure she stays away from. Make sure the child is dressed properly. If his/her boots are not thick enough for the cold, the child will have a miserable time and want to go back to the car. It is a good idea to dress the child for fishing in the worse conditions. When ice fishing, it is always better to start with more clothes than needed. If the child gets hot, they can remove some clothing to be comfortable. It is also a good idea to bring an extra pair of gloves. 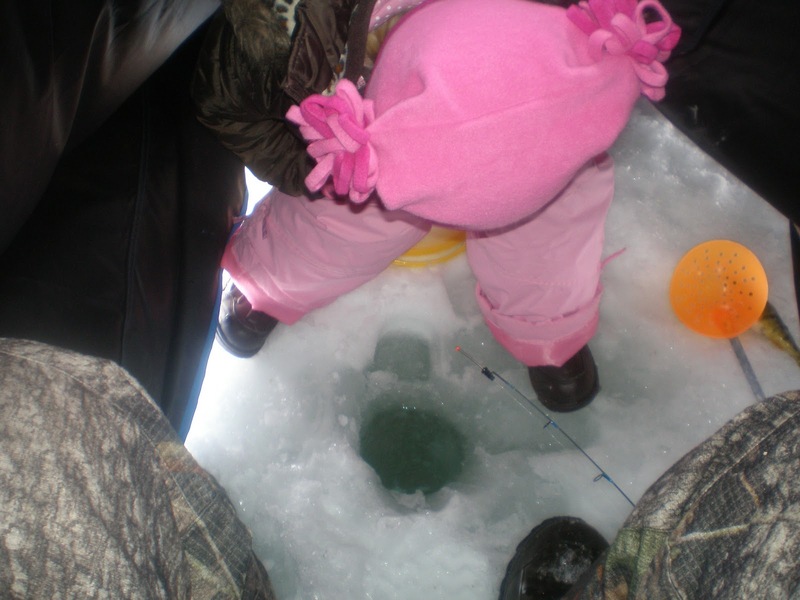 No matter how good the fishing is, most young kids will want to play in the snow or ice at some point. Once the child's gloves are wet, the fateful words are not far behind... Dad, I am ready to go home. Make sure you point out the hole to your child and tell them to keep their feet and hands away from it. My daughter was curious when she saw the hole I drilled and wanted to stick her foot down it. Luckily I caught it before she did, or we would have been walking back to the car. 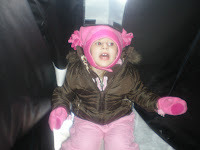 Once the child is dressed for the weather, the next important thing is to keep them occupied. 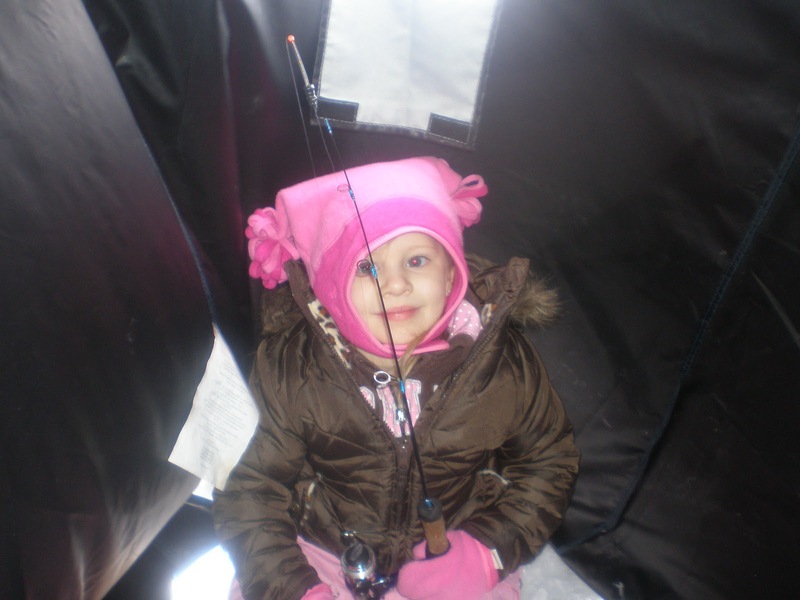 It is a good idea to pick a spot that you and your child can sight fish. Sight fishing can help keep a kid interested for hours. Seeing fish in the hole can be an awesome experience for a kid if they are biting or not. If possible, an angler should pick a lake that has the opportunity for a lot of fish to be caught. When fishing with a child, quantity is better than quality. A youngster will have more fun catching one hundred two inch bluegills then a 10 pound walleye. I like to keep my daughter occupied by asking her how we should get the fish to come into our area. This lets the kid become involved in the experience by thinking on their own. My daughter told me that if we sang songs to the fish, they would start biting. The other anglers in the area must have thought we were crazy, but we were on the ice singing the ABC's. When picking a lake to ice fish, it is also a good idea to find one that is easily accessible and allows for quick access to fishing spots. Canals and small ponds are the best bets for taking a child fishing on. Kids do not realize that the better fishing is a half mile out on the lake. They want to get fishing as soon as possible and 20 feet from the launch, although it may be one foot of water, is where they want to be. Hopefully these tips will help make your child's first fishing trip a memorable one. If all of these tips do not work, do not get discouraged. There is one thing that can save the day... a doughnut stop for the ride home.